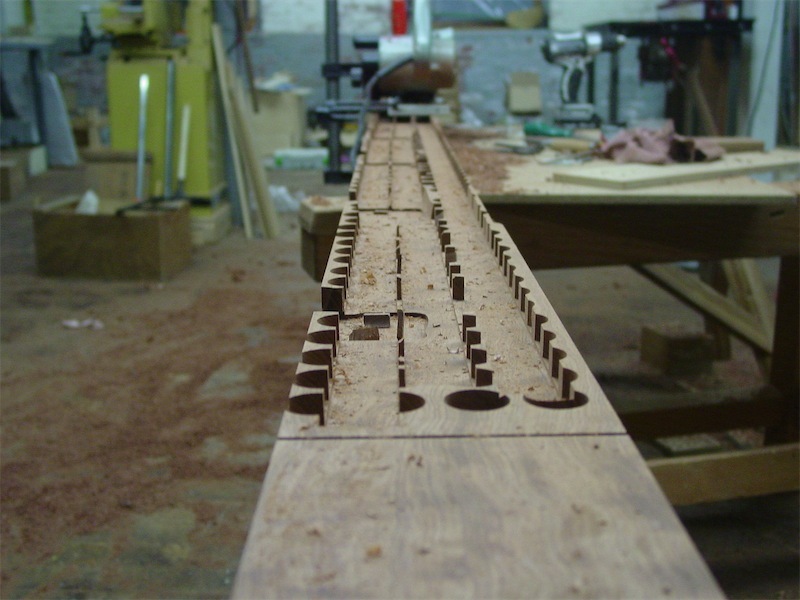 Rolling along with post 18 in this build thread about a Ming-inspired dining table. Ming inspiration with 21st century perspiration. What we have today my friends are a whole bunch of pictures about the process I have been engaged in for the past two days. 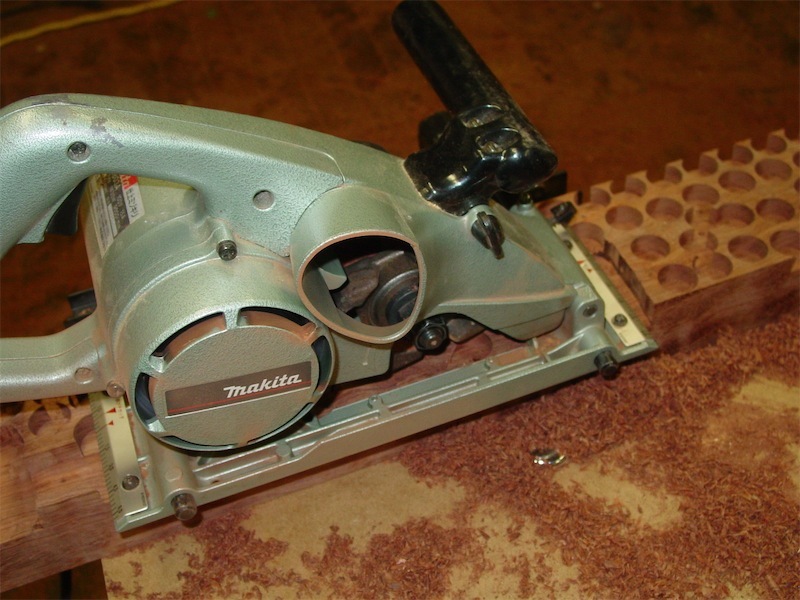 That process, working to complete the profiling on the outer table aprons, could be summarized as follows: rout, plane, scrape, plane, scrape, plane…. you get the idea I’m sure. Did I mention that a fair amount of planing and scraping has occupied me recently? It’s not a bad little plane at all, albeit with a skinnier blade in relation to what I’m used to. If I had gotten some tear out with the shoulder plane, I would have steepened the bevel angle up, but that turned out to be unnecessary. Once the 4 aprons were profiled to the target, I then cut the 4 aprons to final length, plus a hair. Then it was time to remove that material on the back sides of the sticks which I had drilled out a couple of weeks back. The slow-moving approach and gradual work I have done to remove material in a balanced fashion from the sticks appears to have paid off as the sticks remain dead straight. That leaves me with only about 0.1″ of material on deck to remove with the router. That’s tomorrow’s first task on the list, and then I will move towards getting friendly with the corner joints themselves, which, as I mentioned in an earlier post, represent a fairly unique solution to joining the aprons and corner leg with a 3-way miter. Stay tuned. Really looks good. I've been following the entire project so far and I can't wait for each post, let alone the finished table! A very enjoyable read as always Chris. I'd also like to wish you an early Happy Anniversary! I may be out of town late next week so I thought I'd send a thank you now for a great two years of information and lessons you have shared with us all. I have been following along with your adventures in tableland and its been great to see how that beautiful stock is slowly morphing into a piece of furniture. The grain contrasts, where the rod tenons meet their mortices, is fantastic: worth lying on the floor to see. when fitting one thing to another, is extremely useful. Thanks for that and all the posts. May there be many more! many thanks for your kind wishes on the upcoming 2nd anniversay! thanks for your comment and I am glad to hear that you are enjoying this thread. thanks for your kind words as well!